Here's a quick and easy meal you can make in four steps, with just four ingredients, all easily obtainable here in Shanghai. 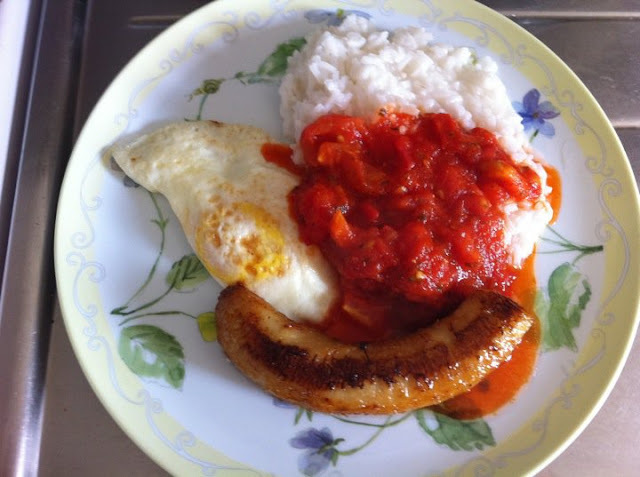 I first learned about Arroz a la Cubana when I lived with a host family in Ibiza, in Spain. The grandma of the family always prepared lunch for us, and in the heat of the summer, she didn't really care to turn on the oven or stove for a long amount of time. As it gets warmer and more humid here in Shanghai, this is the perfect solution to avoid a hot kitchen/apartment. Fry a peeled banana. Wait until it's caramelized. Note: You can also add an extra egg or include some beans, to increase protein intake and swap barley for the rice, to increase fiber and complex carb intake. You can also make the meal with the style of Colombia by adding Queso Fresco (or Feta cheese, which is similar in taste and texture and available here in Shanghai). Assemble the plate as shown below. Ta-da! That's it! Very easy, quick and delicious!